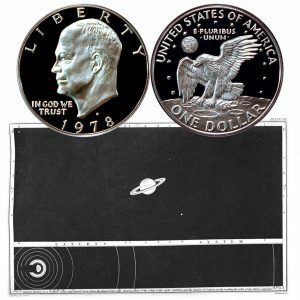 Today, the Eisenhower One Dollar Coin remembers the discoveries by Huygens regarding Saturn’s Titan moon on March 25, 1655, and his correction of earlier theories associated with Saturn’s rings. In the beginning of July 1610, at Padua, Galileo first examined Saturn with his largest telescope. Poor as this instrument would now be considered, utterly insignificant as it would appear beside the gigantic tubes with which the Herschels, Rosse, Lassell, and Bond, have scanned the celestial depths, he had already effected with it a series of the most important discoveries. He had completed its construction in the preceding year— the year in which Kepler announced his first and second laws; and on the 7th of January, 1610, he had discovered by its means four new members of the solar system circulating around Jupiter, the least of which is nearly as large as our moon, while the greatest is equal in magnitude to the planet Mercury. We can imagine with what emotions of interest and expectation he applied his telescope to the examination of the more distant planet. In July 1610, Saturn was approaching opposition, and very favorably situated for observation. Yet the result of Galileo’s inspection was not satisfactory. He could detect a peculiarity in Saturn’s appearance, but he was unable to determine the cause of that peculiarity. It appeared to him that on each side of Saturn’s disc there was a minor disc. The two lesser discs seemed to be perfectly equal and symmetrically placed on opposite sides of Saturn, whose disc they appeared to overlap. Continuing his observations for several months, Galileo found that the two smaller discs retained the same position and were apparently unaltered in magnitude. These appearances were altogether perplexing to him; no phenomenon with which his telescope had hitherto made him acquainted, had prepared him to anticipate or understand a conformation so remarkable. The minor discs were evidently different from Jupiter’s satellites: and, even if they were orbs attending on the central globe, it remained inexplicable that they should be always seen in the same position with respect to it, for this required that they should always be in the same position with respect to the line of sight from the observer on earth, a line whose motions partly depend, as we have seen, on the motions of the earth; so that it would appear as if these singular attendant orbs were partly guided by the earth in their movements about Saturn. He announced the supposed discovery to the world of science, in the form of an anagram produced by transposing the letters of the sentence: — ‘altissimum planetam tergeminum observavi,’ ‘I have observed that the most distant planet is triform; ‘ adopting this fanciful plan to prevent other astronomers from claiming the honor of the discovery. After an interval of a year and a half, Galileo again examined Saturn. To his infinite amazement not a trace was visible of the appearances that had perplexed him before; there in the field of view of his telescope was the golden-tinted disc of the planet as smoothly rounded as the disc of Mars or Jupiter. We can imagine how in his perplexity, he must have thought his telescope in fault, and how, adjusting the instrument, and cleaning the glasses, he must again and again have brought the planet into the field of view, — still to see a single disc, where he had expected to see his triform planet. The changes that Galileo afterwards detected in Saturn’s appearance were still more perplexing. The minor orbs reappeared, and waxed larger and larger, varying strangely in form: finally, they lost their globular appearance altogether, and seemed each to have two mighty arms stretched towards and encompassing the planet. From a drawing in one of his manuscripts it has been supposed that Galileo suspected the true cause of these startling changes. In this drawing Saturn is represented as a globe resting upon a ring. It seems more probable, however, that this drawing is a modern addition to the manuscript, and that Galileo was never able to explain the phenomena whose succession he had observed and recorded. Hevelius, with more powerful instruments, but in a climate less favorable to the astronomical observer, was not more successful than Galileo in explaining Saturn’s mysterious changes of form. In the year 1656 he published his treatise ‘de nativa Saturni facie’ in which he announced the result of his observations, concealing his real perplexity under a flight of sesquipedal words. A year or two before, Huygens, with a telescope of 12 feet focal length, had detected dark spaces enclosed within the as yet unexplained appendages on each side of Saturn’s disc. Thus Saturn appeared as a globe, with two handles symmetrically placed on either side; or, as Hevelius expressed it, as an ansated spheroid. Subsequently, with a telescope of 23 feet focal length, and magnifying 100 times, Huygens saw these dark spaces more distinctly: but the true figure and structure of Saturn remained still a mystery to him. Some of the changes observed in Saturn’s appearance could be explained by supposing the two appendages to be actually ansae, or handle-formed structures attached to Saturn’s body, but others remained inexplicable. It was not credible that the motions of Saturn’s globe should be so exactly adjusted to those of the earth in her orbit, that the diameter through the ansae should be always at right angles to the line of sight from the observer on earth; yet, if this were not the case, it remained impossible to explain how it happened that — whatever variations might appear in the forms of the ansae — they always seemed to stand out to the same distance from the disc of the planet. In the spring of 1656 Saturn appeared without his ansae, though Huygens examined him with a telescope of 123 feet focal length — one of the aerial telescopes he had himself invented. After observing the circumstances attending the disappearance and reappearance of the ansae, and carefully investigating the theories which appeared most plausibly to account for the phenomena, Huygens at length arrived at the true explanation. He announced to his contemporaries, in the year 1659, that Saturn is girdled about by a thin flat ring, inclined to the ecliptic, and not touching the body of the planet. He showed that all the variations in the appearance of this ring are due to the inclination of its plane to the ecliptic, while the tenuity and flatness of the ring explain its disappearance when the edge is turned to the spectator or to the sun. He found that the diameter of the outer circumference of the ring exceeded the diameter of Saturn’s globe in the proportion of about 9 to 4; and he considered the breadth of the ring about equal to the breadth of the space between its inner edge and Saturn’s body. Four years before, on March 25th, 1655, Huygens had made another important discovery: by aid of the 12-feet telescope already mentioned, he had detected a satellite attending on Saturn. Judging from the brightness of this satellite at so vast a distance, he considered that it must greatly exceed the largest of Jupiter’s satellites in magnitude, and be little, if at all, inferior to the planet Mars. It revolves round Saturn in rather less than 16 days, at a distance of nearly 760,000 miles. In 1659, Huygens published a table of its mean motions. As this discovery raised the number of secondary planets to six (including our moon); and as but six primary planets (including the sun) were known to Huygens, he sought for no more satellites — sharing the idea, then commonly entertained, that the numbers of the primary and secondary members of the solar system must certainly be equal. Otherwise, with the powerful telescopes he subsequently constructed, he could not have failed to detect two (if not all) of the four satellites discovered by Cassini. Huygens discovered that Saturn’s globe, like Jupiter’s, is marked by belts parallel to the equator, and on one occasion he observed as many as five; but he was unable to detect any other signs of Saturn’s rotation. The Eisenhower One Dollar Coin shows with images of Saturn from Mr. Proctor’s book.